New “Wait, Do I Know This Person? : Understanding Misdirected Email”, a paper by Emilee Rader and Anjali Munasinghe, will be published at CHI 2019 in Glasgow, UK! New Emilee Rader, Kelley Cotter, and Janghee Cho. Their paper “Explanations as Mechanisms for Supporting Algorithmic Transparency” was accepted at CHI 2018 in Montreal. Janghee Cho: submission to the CHI Student Research Competition, titled ‘Mental Models and Home Virtual Assistants’ was accepted. Submissions must be solo-authored by the graduate student, and this is Janghee’s MA thesis work. Hope Chidziwisano: His paper entitled “M-Kulinda: Using Technology Probes to Explores Domestic Security in Rural Kenya” was accepted at CHI 2018 in Montreal. Rick Wash and Molly Cooper: Their paper “Who Provides Phishing Training? Facts, Stories, and People Like Me” was accepted at CHI 2018 in Montreal. Emilee Rader and Rick Wash were awarded a $93,000 grant from the National Science Foundation to run a “Workshop on Trustworthy Algorithmic Decision-Making”. Emilee will be presenting a paper with Janine Slaker at SOUPS 2017 about their work on the Privacy project, titled “The Importance of Visibility for Folk Theories of Sensor Data”. Kelley Cotter and Janghee Cho will be presenting a poster at CHI 2017 about their work with Emilee on the Algorithmic Curation project, titled “Explaining the News Feed Algorithm: An Analysis of the News Feed FYI Blog”. Chankyung Pak will be presenting a paper at ICWSM 2017 about his work with Rick on the Crowdfunding project, titled “The Rich Get Richer? Limited Learning in Charitable Giving on donorschoose.org”. Chankyung Pak will be presenting his dissertation project, titled “News company’s link sharing on Twitter as informative advertising and content signaling”, at the CHI 2017 Doctoral Consortium. 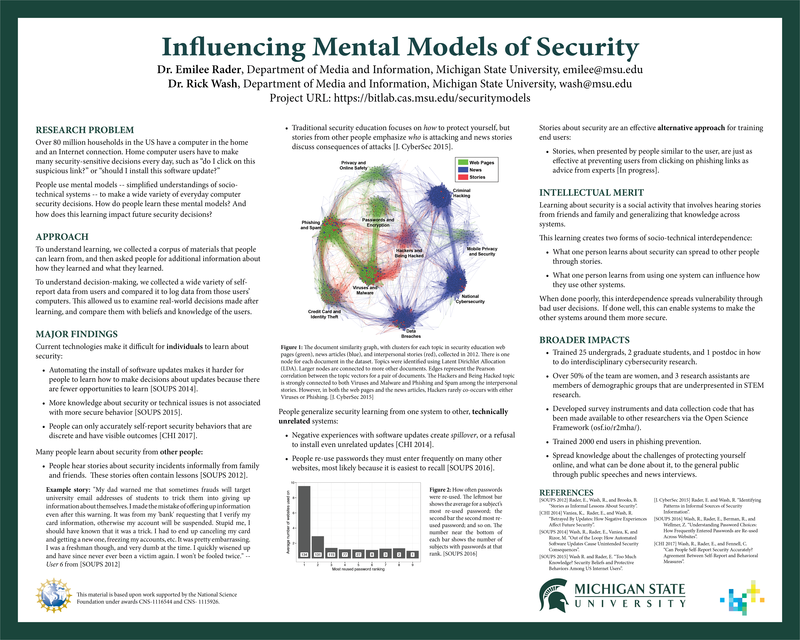 Emilee presented a poster about the NSF-funded security project at the Secure and Trustworthy Cyberspace PI meeting on January 9, 2017. Yumi Jung received a $6000 Dissertation Completion Fellowship from the MSU Graduate School, to complete her thesis research about tradeoffs between risks and benefits when people choose whether to disclose health information in the context of a potential virus outbreak. Shaheen Kanthawala received a $4000 Strosacker Fellowship from the MSU College of Communication Arts and Sciences, along with Jessica Francis (IM PhD) and Kendra Kamp (College of Nursing). Rick and Emilee will participate in the CCC Visioning Workshop on Grand Challenges in Sociotechnical Cybersecurity! Read their workshop paper here. Jacob Solomon successfully defended his PhD dissertation on Intelligent Decision Aids. Congrats Dr. Solomon! We are hiring up to 7 full-time summer research assistants in the areas of data science and social/behavioral science.Filled! Emilee and Rebecca have a paper at CHI, and Susan has two papers at ICTD! Jacob and Rick’s paper about Critical Mass in Wikiprojects was accepted to ICWSM 2014! Filled! We are hiring up to [7 full-time summer research assistants](/summer.html). BITLab faculty and students have 3 papers at CHI this year! Rick received a $489,000 early CAREER grant from the National Science Foundation to study online communities.